Plexing is one of the most important aspects of Faction War. Not only is it a relatively easy way to gain standings and LP for your Faction, but it is also critical to taking systems, and defending your space. There are two kinds of plexing that you can do: defensive and offensive. Defensive plexes are ones you run within systems your Faction owns sovereignty in, whereas offensive plexes are ones you do in hostile systems. FW plexes do not automatically show up on your overview when they spawn in the warzone. You are able to locate available plexes in a system by running a basic system scan with your system scanner. The scanner will pick up any plexes within a 64au distance, so except in very large systems, you will pick up every available plex within that system. 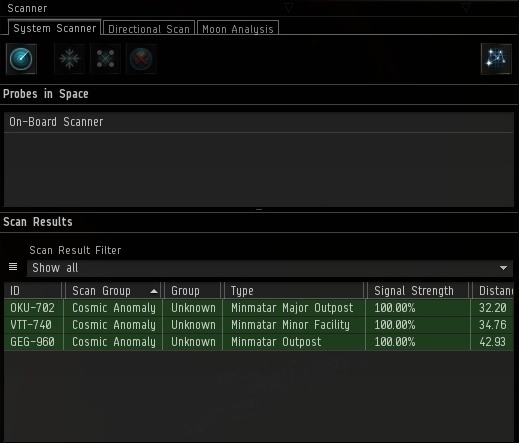 Warping to a plex you’ve found on your scanner will pop open the plex, and a beacon to that plex will appear on your overview. Note: Once a plex has been popped, everyone in local will be able to see the beacon if they have beacons showing on their overview. 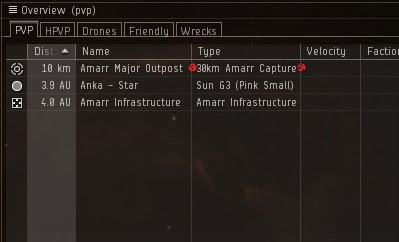 TIP: You should always warp to a plex’s gate at 10km, to prevent getting ‘stuck’ in the gate. Minor plexes only allow Tech One Frigates, and Destroyers to get through the gate. Medium plexes only allow Tech One Cruisers, Tech Two Frigates, and down to get through the gate. Major plexes only allow Tech One Battlecruisers, Tech 2 Cruisers, and down to get through the gate. Unrestricted plexes are rare large plexes that do not have an acceleration gate. Any ship size can warp to these plexes. 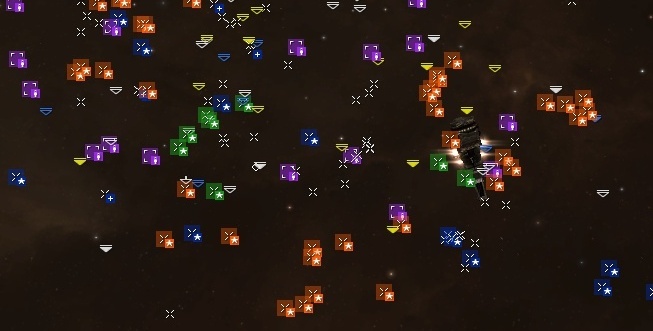 Note: Capitals can warp to unrestricted plexes, however cyno fields cannot be lit near a plex gate, nor within a plex. Once inside a plex, there are several important locations to take note of. The first, is the warp-in location. This is where most of plexpvp occurs, as many pilots will take up defensive locations to kill incoming hostiles. Some pilots will drop a can here, as an easy way to mark the location. You must be within 10k of a Minor plex. You must be within 20k of a Medium plex. You must be within 30k of a Major plex. Completing a Plex will also count toward the contestion or decontestation of a system. CCP has not released the exact formulas used with regards to what factors affect how much a plex contests or decontests a system. However, generally, a plex will provide around .6-.7% contestation/decontestation, and it takes around 150 plexes on average to plex a system from start to finish. Note: Completing an Offensive Plex in a system with upgrades will take LP out of the enemy’s I-HUB, and possibly cause them to lose upgrades in that system. Note: Once a system has been offensively plexed to 100%, a system will go vulnerable and the I-HUB will become lockable. Once a system is ‘lost,’ plexes in the system will go inert. PVP often happens within plexes as players attempt to force each other out of various plexes within systems. Entering a plex that contains hostile counting down the timer does not automatically stop the timer. You must be in range of the timer in order to stop it. If members of both friendly and hostile militias are within range of the button, the counter will stop altogether. Note: Enemies can cap a plex with you inside if you fail to get to the button in time. Counting down a timer counts a timer the opposite direction for the opposing militia. Therefore, if you take over a plex that you enemy has been running, you will need to run the base time + any time the hostiles have put on it. Partially Running Down Plexes: Completing Defensive plexes in a stable system really does no good. So, as an extra means of defense, some pilots will run the plex down until it has very little time on it, and leave it open. For example, if someone runs a defensive major plex, and leave only 30 seconds on it, when an enemy enters the plex to take it he will have 20 minutes + 19.5 minutes left on the plex. Camping the Acceleration Gate: While many ship types cannot enter a plex, anyone can warp to the acceleration gate of that plex and camp it with any ship type. While most pilots in smaller ships will easily be able to activate the gate and get inside before getting caught, others can be pointed and prevented from entering the plex. Neutrals will often camp Faction War plex gates. 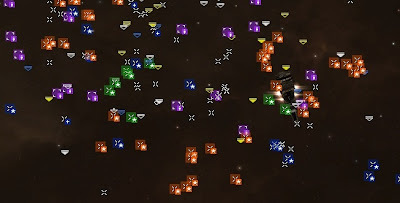 One on the Button: In most cases, fleets doing a plex together will assign one person on the button while the rest of the fleet camps the warp-in. ECM ships, fast ships, or long range ships are usually assigned this task. If it is an offensive plex, fleet members will wait until the last minute before approaching the button for their LP payout. Killing your enemy on the warp-in will prevent them from reaching the button, and stopping the timer. If combat occurs within range of a button, and/or the plex changes hands multiple times, the plex will almost always become ‘bugged.’ It will count down as usual, but will often not complete—no LP payout will be paid, and the plex will not despawn for a while. It has been reported that getting out of the plex, and going back in and reapproaching the button will occasionally ‘de-bug’ the plex. Note: Purposefully bugging plexes is considered a bannable exploit. Can I run Ally’s plexes? Yes. You can run defensive plexes for your allies, or offensive plexes against your allies’ enemies. However, you will get LP for your own Faction doing this. For example, a Minmatar can go run an offensive Caldariplex, but will receive Minmatar LP for completing it. Can neutrals enter Faction War plexes? You bet. They will not get LP, and the button will not count down for them, but they could attack you while you are in the plex. Can people cloak inside plexes? Yes. With the proper setup, you can solo almost any size plex. This is a source of contention among Faction pilots, as differences in NPCs make soloing some Faction’s plexes very hard, and others very easy. CCP intends to balance and change many NPC concerns in coming patches/expansions. Why aren’t the rats shooting me in the offensive plexes? Why and when the NPCs shoot is based on standings and not on what militia you are in. Therefore, if you have positive standings with the hostile militia, the NPCs inside offensive plexes will not shoot you. If you have negative standings with the friendly militia, NPCs in defensive plexes will shoot you. Does plexing result in negative standings with hostile Factions? Yes. Plexing can seriously reduce your Faction standings with the hostile Faction, but only if you are within the plex when it is capped. Would be nice to update this to Retribution as it was a great resource to point FW noobs at.